Companies such as Inrix, Navteq, AirSage, TomTom, Google and TrafficCast are using more and more innovative ideas to bring us more and more accurate traffic data at lower and lower prices. The original method of traffic reporting was the ‘eye in the sky’ reporter who flew over cities in a helicopter. These reports were on the hour usually and ad supported. The reporters were local celebrities that everyone knew. After the eye in the sky the next stage of traffic reporting used sensors built into the roads probably like loop detectors they use at drive throughs so they know you’ve pulled up have been in use in maybe 40 metro areas. Some are public and some are owned by Nokia/Navteq/Traffic.com. Interesting story about how taxpayer money was funneled to Traffic.com for sensors and a lot of them are the property of Traffic.com – not available to third party providers. At any one time a third of these is not working correctly and they are expensive and difficult to replace or install. In the early 2000’s General Motors performed a study on traffic and came to this conclusion re gps probes – For accurate highway flow data nationwide – 3 million probes are necessary while secondary roads need 5 million. So 8 million probes are necessary to get good flow data across the US. This means 3 or 8 million probes actually on the road at the time reporting in real time so it may take millions more than that to actually reach that condition. At this point in the mid 2000 time frame Inrix and Google covered just the major highways. Meanwhile traffic.com covered just the main metro areas, with no interconnecting highways. Inrix had slowly and steadily increased their probe count till in 2008 they claimed about 800,000 probes. Google was very secretive about their probe count at that point. During the same time period small start ups such as AirSage, Intellitraffic, Applied Generics (in Europe) and TrafficCast started to make waves along with some others such as Delcan, Cellint etc. They were all developing traffic flow data using cell phone triangulation. They all used similar methods but each has a twist of its own. After quite a few studies it was found that above 30mph this method is not only accurate but cheap to implement. Under 30mph this data needs accompanying data from gps probes for verification. Applied Generics though had a way to get higher accuracy out of the data based on a pretty straight forward idea. The idea is that when traffic slows considerably people in that jam use their phone to call and say they will be late or just to make a call to ease the wait. So their algorithm takes that into account. In 2006 TomTom buys Applied Generics and signs a deal with Vodafone in Europe to use their phones through Applied Generics system for traffic they would call HD Traffic. It was about this time that a startup, Dash in the US came out with a gps connected to the cell network. The idea was to use the gps as a probe complimented by another traffic providers data – Inrix. The product was innovative providing features not seen anywhere else still, but the routing was terrible and they never had the numbers for good traffic data. Dash is purchased by RIM and seemingly buried. Google now uses AirSage cell phone triangulations with their own gps probes. AirSage monitors both Sprint and Verizon phones totaling 150 million phones while Google uses gps tracks from their latitude app (just made available for the iPhone), their Android phones which are now selling at a clip of 300,000 a day, and possibly still the Nextel probes – I am unsure of that. Google may have as many as 30 million gps probes in the US or as few as say 15-20 million. Still that makes them number 1 and as they tweak their own algorithms their data should get better and better. Google has reached the magic number for accuracy. Inrix now claims north of 3 million probes and I believe they are being conservative. They had about a million when two things started to happen: they started free traffic apps for the iPhone which is popular and the service provided for Ford (and recently starting for Toyota) is bearing huge fruit in the form of probes. Ford just announced their Sync product has reached 3 million users. Its likely Inrix is north of 5 million right now. Inrix also has incident data they receive from local DOTs (Department of Transportation) and from Clear Channel (FM Radio) plus they add in variables for school buses, weather, events and red lights. They maximize what they have and they are closing in on the magic number. TomTom HDTrafiic is considered the best there is in Europe. They have 90 million Vodafone phones being tracked across Europe and a few million gps probes from their connected gps systems there. They estimate they will have 25 million gps probes in Europe by 2014. They have just announced HD Traffic in the US but its significantly different. Here is the best information on the web right now on whats coming from TomTom later this year coutesy of GPSPassion’s CES report via TomTom’s US head of US traffic. This info will not be found anywhere else on the web unless its copied from his post. I believe with the accuracy of IQ Routes TomTom feels they just need to see the exceptions with fewer probes and I believe they used the last two years to experiment using TrafficCast’s probe info. Unique to TomTom for now is the use of OpenLR that allows them to place traffic information on potentially 6 million miles versus de 0.5 million miles afforded by TMC codes built into maps. Other players in the industry are NIM which turnkeys their product to cell carriers such as Verizon’s Navigator. NIM bought out Traffic Gauge for their back office traffic savvy and to turn their customers into probes. NIM/TCS uses the 14 million Navigator users as probes and feeds that back to the users. I believe they use Navteq/Traffic.com as the provider and tweak with their own data. NIM has reached the magic number but its unclear at this point whether they are losing market share. NIM was bought by TCS which almost certainly will further monetize the probes and sell the raw data to other providers. RIM at the beginning of the summer announced they would start using Blackberrys as probes and that customers would have to opt out meaning the uptake will be huge maybe 80% and Blackberry has about 20 million phones in the US so maybe 16 million probes. This is Dash back from the dead with some huge numbers to work with. RIM from what I can gather will make these available to other providers on a raw data basis. Who will get these probes is anyone’s guess but I’ll wager Inrix or Navteq and more likely Inrix since Nokia is a competitor. 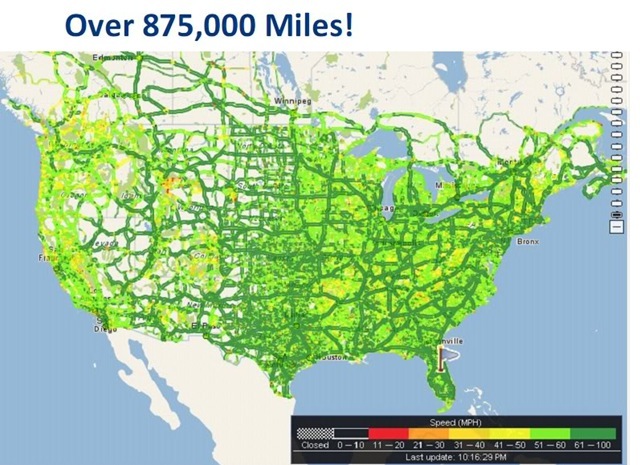 TrafficCast this year will update their flow coverage to 880,000 miles about the same as Inrix. They are touting a method of tracking cars by bluetooth. The roadside sensors which are solar powered and linked via wireless radio watch for a bluetooth signal to come by within 250 feet So you are driving by and it picks up your phone traveling at 65mph or the EZ -Pass transponders people have for toll travel are also bluetooth in nature so those can be tracked. TrafficCast claims this method is 1/300th the cost of using cell triangulation or gps probes. The sensors are just bolted down near the road and thats it. The rest is wireless. Update on Navteq Traffic: With Nokia’s move to WP 7 its likely they’ll get subsidy support from and manufacture for all 4 carriers. If they can sell 2 million WP 7 phones per year per carrier that’ll give them 14 million probes. 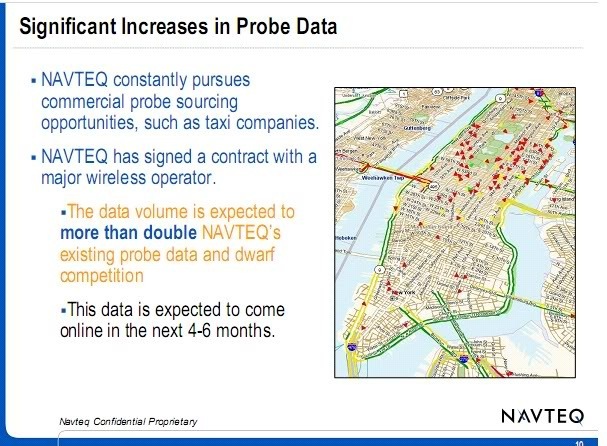 Adding that to the probes they have from their Trapster purchase (9 million) and the commercial probes and Navteq reaches the magic number in a couple of years also. So the main methods of tracking traffic flow today are through gps devices that can also send their location including fleets, and also most cell phones now. Then its the use of cell phone triangulation and finally the newest method is through bluetooth. There probably needs to be some consolidation or sharing of probe data among the big players so that the gps probe numbers can get really big. Based on the rapid change this part of the gps business has gone through I predict in a year or two high quality traffic data will be the norm. The last bit of traffic info is how you get it on your gps and how the traffic information distribution system affects the quality of the data. The original method which is still in use via FM Radio is TMC-RDS: http://en.wikipedia.org/wiki/Traffic_Message_Channel This wikipedia profile tells you the basics. Problems with this method are the data transfer speed which is extremely low 40 bits data transfers, low speeds and since its one way via an analog signal they must repeat the same info over and over for errors which are caused by low signal levels, multipath, tall buildings etc. TMC is limited to class 1 roads the highways only. Due to speed limitations and the multiple transfers to account for errors the data you get is both inaccurate and untimely. A much better one way system is available but there has been only one 3rd rate gps company to start using it – traffic data over HD Radio. One time transmission with much much faster speeds and bandwidth. These if it ever replaces TMC-RDS can send a great deal of data meaning secondary road coverage may be available this way soon. Coverage though is an issue because HD Radio just hasn’t been a booming product. Its the chicken or the egg conundrum. Why build an HD Radio infrastructure if its not selling versus why buy an HD Radio product when there aren’t a lot of stations using it. Then there is the connected gps pioneered by Dash and taken up by TomTom and Garmin. When its working right traffic is the same as you’d get online and its robust meaning secondary road coverage is not an issue. This is where the future lays. I have some images from what are marked as proprietary documents I have come across on the web. This is pic of Inrix’s national coverage – its fairly comprehensive. Look at the Canadian data there – impressive also. 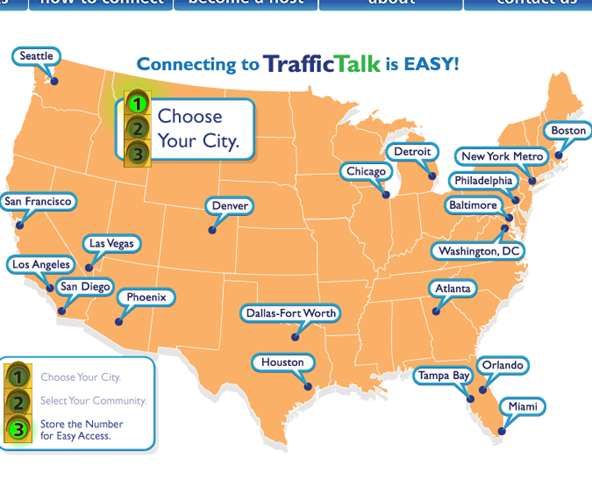 I doubt any of the free traffic services online have their best traffic data. This is most likely reserved for paying customers. This is their coverage in Phoenix. You can see every street is covered. Not only is every street covered but the color coding is correct. They say Green represents 45mph and above. 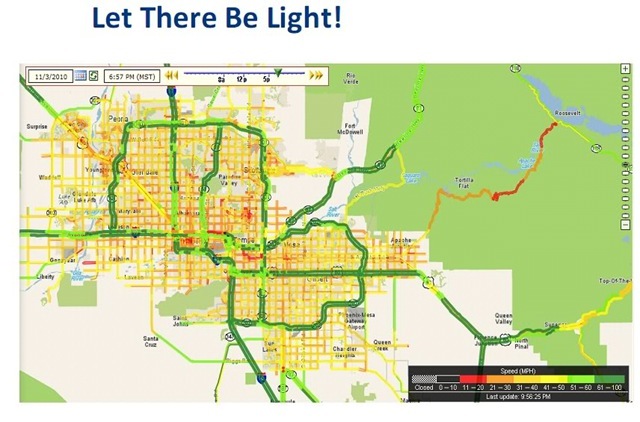 So when looking at these traffic maps why do some small roads with 25mph top speeds show green? They shouldn’t. This is again imo another difference between free and paid. Notice that all the secondary roads are yellow and red here. 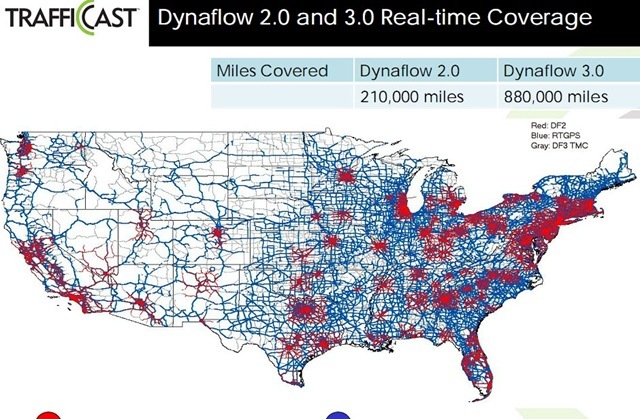 This is a map of TrafficCasts next generation Dynaflow 3 which should be released soon. The red areas are existing coverage and the blue is the extended. The new coverage will also increase coverage within the red areas. Finally from Navteq this blurb shows that at some point Navteq expects some huge increase in probes (the Nokias and possibly Blackberrys)plus it appears a major carriers cell triangulation data.One of the things I believe holding up Navteq is they have to map the US with the virtual trip lines they are using in Europe and the US is just a larger project. They are done or close to done in Europe and the US is on deck so to speak. This concept, TrafficTalk, makes everyone a potential ‘eye in the sky’ able to report traffic tie ups, accidents and such to other users in a particular area. You just need to dial the number and enter the code for an area. Its available in the top twenty metro areas right now with more coming. Its in the twenty most congested cities right now and more are coming. Each area is broken up into smaller areas. When the conference calls get congested the plan is to have a host for the call who will control things and keep them manageable. 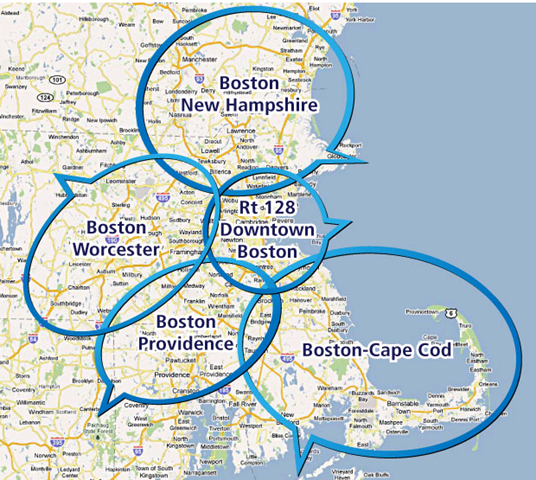 Here is the break down for the Boston area just to show an example. When you move from area to area you simply dial back in and enter a different code. If this reaches critical mass user wise you’ll hear which lane to get into in order to squeeze by an accident which exit to get off on to avoid traffic etc etc. This is info that’s impossible at this point for a traffic data service to offer. Japan’s probe data is so far ahead of ours that they track traffic by the lane so they can get this type of info. We won’t be there for a few years though. Nokia/Navteqs traffic service in the US is woefully behind its European service because they use Nokia phones as gps probes and Nokia just doesn’t sell well in the US. That changed today with Nokia’s move to Windows Phone 7. WP 7 will start using OVI maps or a merged version of OVI and Bing on all its WP 7 sets no matter who the manufacturer is and Nokia will benefit from association with Microsoft by better relationships with US carriers. They should have subsidies from&nbsp; all 4 carriers though whether they roll out cdma versions right away is debatable. The bottom line for the Navteq traffic service is many more probes out there in rush hours. Lets say 6 million WP 7 sets are sold each year. That means 14 million traffic probes given a 2 year life span for the phone. I’m betting Navteq has 1 million commercial gps probes now and they just picked up 9 million Trapster probes so in a couple of years they’ll have more than enough probes to provide accurate traffic data on all but the smallest roads.